President John F. Kennedy addresses the nation on Oct. 22, 1962, regarding the Cuban Missile Crisis. Yes, nukes must be banned. However, the military bloat is from conventional systems and the executive office Adventurism. Leadership is what created this Adventurism mess. Since 1945, the federal government has served this country a Great illness. This illness started small in 1917, with the Espionage Act. After World War 2, it grew precisely from Americans throwing away their votes to elect Leaders. But, again, I have gotten ahead of the story. 100 years of the Federal government easing the people out of their lawful right to know what their government is up to, has left the people unable to make any meaningful decisions. When our increases in representation in the House were stopped, we were effectively removed from the equation. There is nothing to question this as other than fact. Check the records, not a single real increase since the 1910 Census. This was certified in 1929 by Public Law 62-5 at 435 members in the House of Representatives of these United States of America. Our rightful voice has only diminished since then. Today we have 3 times the population. Since 1945, many secret agencies have been created to which We the People have no access to. Committee hearings in Congress go unrecorded or there is no record which we can get of those hearings. The Federal Government operates in secrecy, so how can we ever make informed decisions at all? All we do is rubber stamp the oligarchy in Washington DC for our Dictatorship Democracy. These Leaders do the devil’s work with no thought to right or wrong, and no concern for the people of the country or the world. The modern President sends citizens on fool’s missions to die. And now the can kill all more, by way of the fiendish drone program, aptly called the Disposition Matrix by some. This is what Leadership inside the beltway is, Dictatorship. It is the very tyranny we fought 236 yeas ago. The People, Americans, must rise up and remove this Federal Government invasion, take charge of their government again, and with new tools to insure we never repeat our National Military Socialism Adventurism again. Electing Leaders in a nationalistic federal government framework was debated much in the Convention of 1787. They warned of concentrating too much power into a single person. Yet, today this is what we have. Congress is largely to blame for circumventing and disregarding the Constitution for 95 years. “…collective will and leadership…” however, must come from Americans, and not those elected as Leaders. “…competition for precious resources…” and the lust for ever more profits fuels much discord and poverty. Puuuuleeease, the Kennedy assassination is one of the most thoroughly researched events of its kind. Though there are many theories, and Israeli elements could have been involved the major players were largely domestic. Israel is bad but there are more and badder actors in the world. Kennedy managed to piss off some of the most powerful and ruthless elements of American society; the joint chief’s of staff, the CIA,the Mafia and the Cuban emigres. He had just ordered the beginning of a withdrawal from Vietnam, which had been preceded by cutting bait in Laos and Cambodia. That and not backing up the Bay of Pigs invasion and not attacking Cuba during the missile crisis convinced the insanely aggressive Joint Chiefs that he was dangerously “soft on Communism”. He had fired Allen Dulles, CIA chief over the Bay of Pigs fiasco. The “notorious” Dulles brothers had long been among the most powerful elements in foreign policy. And of course, the Cuban emigres in Miami were furious at him for Bay of Pigs. On the home front brother Bobby had launched the first serious attack on the US Mafia; since LBJ hated Bobby a Johnson presidency would be incompatible with him as Attorney General. And of course, J. Edgar Hoover hated the Kennedys and could be relied on to cover the deed up. 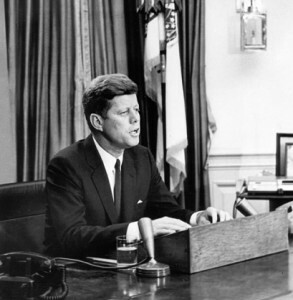 Unfortunately the original article does not mention that the Cuban missile crisis was resolved, despite the Joint Chief’s fervent desire to immediately attack Cuba, because the US and Russia had two leaders who were wise enough to by-pass their own untrustworthy bureaucracies to negotiate directly under the table, so to speak. American Depleted Uranium ( WMD)in Iraq. Families in numerous Iraqi cities are now living with a dramatic rise in birth defects and cancer from chemical weapons that were detonated near homes, schools, and playgrounds during the nearly seven-year conflict. The Jews assassinated Jack Kennedy. Why am I not surprised? Did the Jews also get Bobby?